Let’s take a look at what’s happening in Emmerdale this week shall we? It looks like a case of Chinese whispers leads Cain to the wrong conclusion, Aaron officially becomes a Dingle and we say a sad farewell to Edna. Eager to please, Holly agrees to do some digging for Cain to try and find out who Belle’s boyfriend is. Belle revels in the chance to talk about her boyfriend and reveals to Holly that he’s a married man and that she’s seeing him that night. Holly tells Cain but it looks like he may have jumped to the wrong conclusion when he thinks it’s Rakesh. He kidnaps him and has him tied to a chair and blindfolded in a barn then realises he’s got the wrong man when he learns that Belle has been out all night with her boyfriend. Will Rakesh offer him a way out of the situation? Meanwhile, Lisa is put out when she asks Belle about the morning after pill and Belle tells her it’s none of her business. However, with all the pressure from her family, Belle reluctantly tells Dr Bailey they have to end their affair. She’s heartbroken as she tells Cain that she’s ended it and then has a go at Holly when she realises she’s the one who told Cain in the first place. Holly is getting more and more jealous of her mum’s relationship with Cain and tears up their anniversary gig tickets and puts the blame at Charity’s door. It’s a week of mixed emotions for Aaron. At the start of the week, he’s struggling being a pseudo parent to his half-sister Liv. Robert is also left frustrated by Liv getting in the way of him seeing Aaron. It seems Liv is determined to go to Gordon’s sentencing despite Aaron telling her she can’t go. She begs Gabby to cover for her whilst she heads to court, but her cover is blown when Chas receives a call from the school to say Liv’s not arrived. Robert offers to go to the court, suspecting that’s where she might be, and the pair have a heart-to-heart. 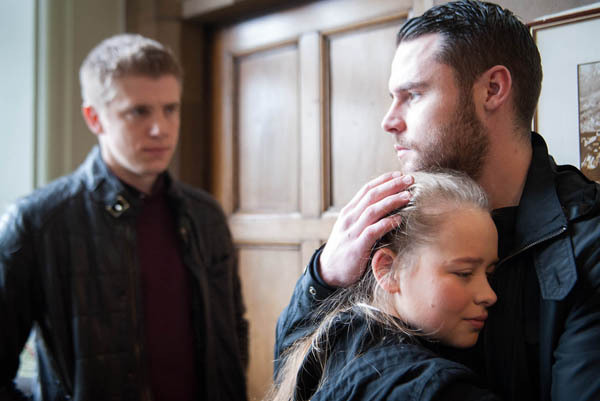 He tells her that she needs to explain to Aaron the reason she needs to see Gordon get sentenced and soon he’s arrived and the siblings go in to court together. As Gordon receives his sentence, Aaron is left confused when he mentions a letter he sent him. Aaron confronts Robert about the letter and is furious that he didn’t give it to him. He fumes as Robert fills him in on the contents of the letter. On the good news front, Aaron gets a letter from the deed poll confirming he’s now officially Aaron Dingle and Charity and Chas start planning a family party to celebrate. However, there’s more bad news to come for Aaron when DS Wise arrives with shocking news. Liv overhears a conversation that could have major consequences for Robert as she later sends a text to DS Wise from Chas’ phone asking to see him urgently. Emma tries to cover up her lie about possibly having Motor Neurone disease by persuading Pete that its best they keep it a secret for now. However, Pete tells Finn and he becomes immediately suspicious and insists that he and Pete accompany Emma to the doctors to collect the test results. At the doctors, Emma is twitchy but could she have just been handed a lifeline by Belle arriving? When Dr Bailey finally calls Emma, Finn and Pete into his office, why is Emma looking so confident? Later, Ross is concerned to hear of Emma’s health problems and perhaps it’s given him a change of heart about family as he tries to persuade Pete to stay in the village and work together on a family taxi business. Can Pete be swayed or is there too much bad blood between the brothers? The villagers gather to say goodbye to Edna Birch. As the hearse pulls up, everyone shares their fond memories of the village stalwart. It seems it’s too much for Sandy as he sits by the river and says his own goodbyes to his dear friend. Charity tells Diane she finally has the money to buy her half of The Woolpack, but Chas is suddenly stressed out by the thought of Charity as her business partner. Will Diane go through with the sale? Carly obviously fancies Pierce, but is that the little green eyed monster we see in Rhona when Carly asks her if Pierce is single? Vanessa is suspicious and tries to test Rhona as Carly flirts with Pierce. Jimmy and Nicola set each other a challenge to line Jai up with a date. Who will be the lucky ladies? Ashley inadvertently helps a fellow dementia sufferer when he finds him confused in David’s shop and realises he must be there for the support group Harriet has set up. Ashley puts two and two together and takes him to the group. Will he stay for himself too?